We freaks on the lunatic fringe have been screaming about chemtrails and geoengineering for years. The culprits have consistently called us “Conspiracy Theorists” and tossed us aside with our tinfoil hats in prominent display. Now poisoning the atmosphere and earth below is a GOOD IDEA. If you cannot hide it any longer, it must be: Time to FEATURE IT. Funnily enough, the same news site which shared this breaking story in mid-April 2017, the Daily Mail, also published an article declaring that chemtrails were fake not too long ago. Apparently, they’ve had a change of heart. Chemtrails are now suddenly a “tool” to save the planet, we’re told! As the Daily Mail now admits, Harvard scientists have announced that they will be using aerosol sprays in the sky, purportedly in an effort to gain control over Earth’s climate. Some scientists, however, believe that the effects of this could be catastrophic. Surprise, surprise. The Harvard researchers say that the so-called “first-of-its-kind” experiment will likely begin sometime next year. Of course, this is not really the first time scientists will be spraying aerosols into the atmosphere; it’s just the first time they’re actually admitting it. EPA whistleblower Michael Davis, who served with the agency for 16 years and worked for the National Pollution Discharge Elimination Systems (NPDES) Programs Branch of the Water Division in Region 5, located in Chicago, Illinois, came forward earlier this year to expose the federal agency’s geoengineering efforts. Davis was reportedly fired for daring to speak up about his concerns. “I was terminated as a public servant performing a public service for raising the issues of anthropogenic deposition of aluminum due to atmospheric geoengineering,” he stated. Davis is not the only scientist who has concerns about the consequences of attempted climate control. The controversial technique of using aerosol sprays to block the sun’s rays could yield catastrophic consequences. Not only would carbon dioxide continue to build up, but some researchers say that should we ever need to stop spraying the aerosols — perhaps because of damage done to the environment as the compounds fall to the ground — it could inevitably lead to an expedited global shift in temperature. As Daily Mail explains, in the past, researchers were at least focused on using non-reactive compounds. Funnily enough, referencing past research clearly shows that geoengineering is not new. The use of non-reactive compounds was first investigated as a way to minimize damage to the ozone layer, but researchers are now throwing caution to the wind. “Instead of trying to minimise the reactivity of the aerosol, we wanted a material that is highly reactive but in a way that would avoid ozone destruction,” said co-author Frank Keutsch. The researchers are reportedly now focusing on calcite, which is a fairly reactive compound found in limestone. This an odd choice because when calcite breaks down, it produces carbon dioxide — which is what climate change enthusiasts generally blame for climate change to begin with. Calcite is known for doing this in the presence of an acid, specifically diluted hydrochloric acid (HCl). And as research has documented, this acid is present in Earth’s atmosphere — and in 2014, it was documented that the amount of HCl in the Earth’s stratosphere had increased. You can see where this is going: If these two compounds were to meet, it could potentially lead to the production of more CO2, especially given that nano-sized or smaller particles of calcite would be needed to create an aerosol. 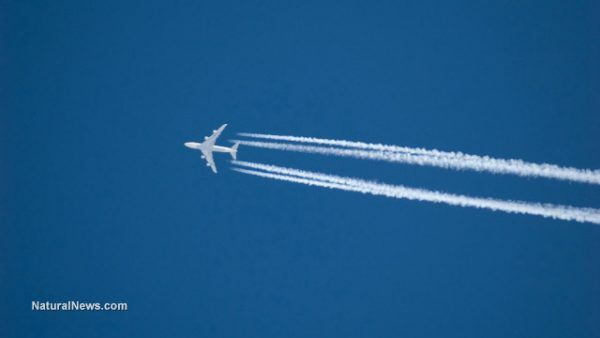 As the National Oceanic and Atmospheric Administration explains, “Carbon dioxide belongs to a category of gases known as ‘greenhouse gases.’” Greenhouse gases are considered to be one of the factors that contribute to the “global warming” that these geoengineering efforts are purportedly being designed to fight. Perhaps this is why the researchers say that if the sun’s rays were no longer blocked, their efforts would actually cause Earth’s temperature to shift even faster. When more of the people’s sustenance is exacted through the form of taxation than is necessary to meet the just obligations of government, such exaction becomes ruthless extortion and a violation of the fundamental principles of a free government.